As an aficionado of both dice and semiotics, I was very excited to find Rory's Story Cubes in my FLGS (Friendly Local Game Store) a few weeks ago. This set consists of nine six-sided dice featuring 54 different icons; every side of every die is unique. 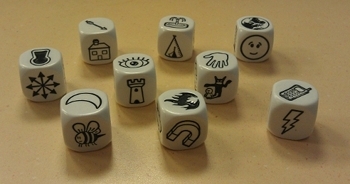 Rory's Story Cubes is presented as a storytelling game, and offers a few short ways of using them as such, all of which revolve around rolling the dice, creating a sequence of images, and constructing a story based on that sequence. When used as a game to tell stories, they are a perfect example of how the syntagmatic dimension functions. In semiotics, this dimension refers to how the relationships between signs affects their meaning. In language this manifests as syntax. Here, the sequence of images as displayed on the cubes is syntagmatic in that the meaning of a given cube in shaping the story is necessarily formed by the adjacent cubes. Placing the bee before the keyhole would be very different than before the open hand. In the first example, the bee would likely be interpreted as passing through the keyhole, where the second example implies that the bee was swatted. Another example of how the syntagmatic dimension shapes meaning is the Kuleshov Effect, a phenomenon related to montage. Named after Russian filmmaker Lev Kuleshov, the Kuleshov Effect describes how an audience brings their own emotions and backgrounds into play when interpreting a sequence of images. Similarly, the meaning of the cubes is also shaped by the players. It makes just as much sense to interpret the bee-hand combination as meaning that the bee landed on the hand, or stung the hand, and so on. "It is useful to distinguish between strings as they appear to readers and strings as they exist in the text, since these may not always be the same. For want of better terms, I call the former scriptons and the latter textons. [...] In addition to textons and scriptons, a text consists of what I call a traversal function - the mechanism by which scriptons are revealed or generated from textons and presented to the user of the text" (62). In Rory's Story Cubes, the "textons" include all 54 images, while the "scriptons" are whichever images are currently, for lack of a better term, "active" - that is, being made use of by the user. The traversal function is built into their physical nature as dice: the act of rolling them generates the scriptons. Of course, Aarseth developed these concepts as a means of analyzing textual artifacts, whose primary function is "to relay verbal information" (ibid.). He further notes that scriptons "are what an 'ideal reader' reads by strictly following the linear structure of the textual output" (ibid.). The scriptons in Rory's Story Cubes, however, are not meant to be "read" in the manner Aarseth describes, but rather are used as tools and prompts for constructing a narrative. This is a key distinction between the Cubes and purely textual machines, and alternative terms to "textons" and "scriptons" are called for, to account for artifacts such as these. While Rory's Story Cubes are certainly effective illustrations of all of these principles, what I personally find compelling about them is not the meanings that can come out of rolling them, but rather that the near-infinite sum of meanings they might release and enable has been so elegantly constrained by their form. It is the many potential meanings highly compressed in the textons that charm, not the meanings brought out by the scriptons. That's sounds a lot of fun. I wish I could try it too. Where can you buy the set? I'm playing very common games like uno, razz poker, and other variety of games using the same old cards.